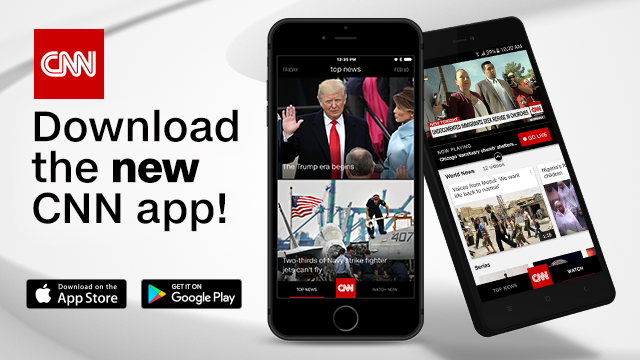 CNN has reimagined mobile news, unveiling a brand new app rebuilt for speed, simplicity, in-depth storytelling and a focused, first-in-class video experience. CNN’s 24/7 worldwide multimedia reporting will be updated constantly throughout the day, allowing users to experience the world of breaking news through in-depth stories, photo galleries and news video from every corner of the globe. Featuring enhanced live streaming capabilities, the CNN app now allows users in the U.S. to watch live CNN, CNN International or HLN television, anytime, anywhere through CNNgo. After the first 10 minutes of viewing live television every day, users will be prompted to log in with their satellite or cable provider information for unlimited viewing. Digital only live feeds are also featured in the app. On-demand content is also available from a library of more than 100 hours of programming from CNN news programs like “Anderson Cooper 360,” CNN Original Series like “Anthony Bourdain: Parts Unknown” and award-winning CNN Films. The new app features custom alert settings, allowing app users to select the frequency they’d like to receive breaking news alerts from CNN. News junkies can choose to get all of CNN’s breaking news alerts, the day’s top news, or no alerts at all. Users will also be able to view CNN’s virtual reality content directly in the CNN app, through an incredible native 360 viewing experience. Available now for download in the iOS and Android app stores.